When Michael and I travel, we are all about trying to find an authentic experience. 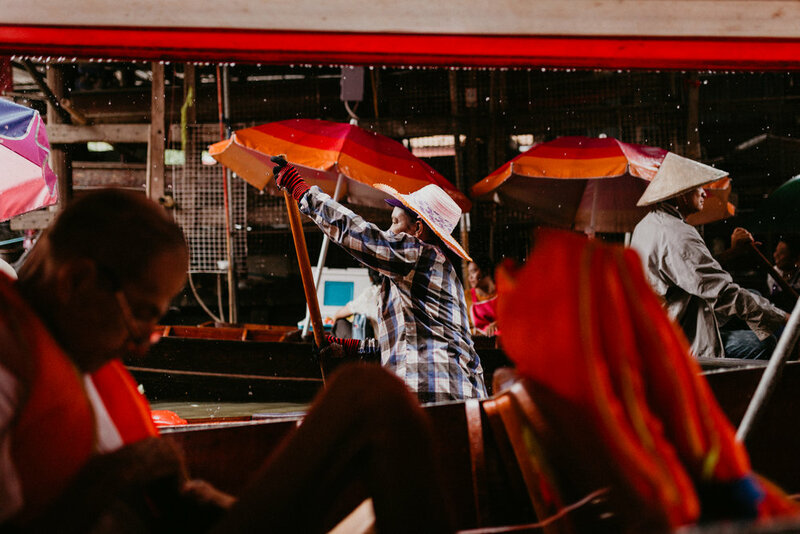 And even though there are much easier ways to get to the Damnoen Saduak Floating Market outside of Bangkok, we wanted to go the cheapest way possible. We could have, and now recommend scheduling a tour online from one of the reputable TripAdvisor tours. You could also schedule your own taxi service from whichever hotel or accommodation you are staying. However, for those seeking a little more adventure, a little more uncertainty, and just trying to be a bit more economical - be like us and take the bus! You have to understand that nearly all of the Damnoen Saduak Floating Market tours leave early in the morning - and many book out in advance. Michael and I are late risers. We missed that opportunity, and with limited time in Bangkok, we set out to get there under any and all circumstances. This is something we could NOT miss being in Thailand. 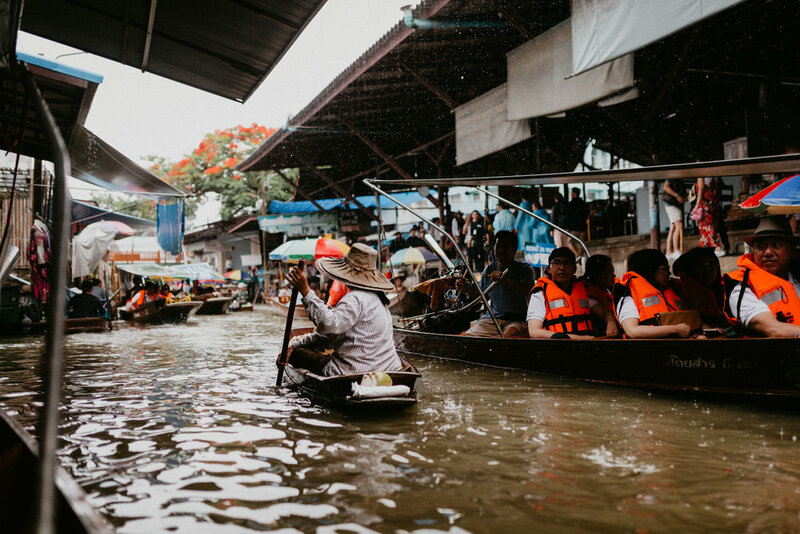 While there are other floating markets throughout the city of Bangkok much closer to the hotels, we read and heard from many that these are slightly disappointing. If you want to see the real thing in all of it’s glory, take half a day and make a trip out of seeing Damnoen Saduak! We began our journey stumbling down the stairs of our small hotel within the historic Old City. We asked the receptionist his opinion on the best way to get to the Floating Market. He then explained all the tours have already departed, and that we should book a taxi. Michael and I both knew that an $70 taxi ride to get an hour and a half outside the city wasn’t in our budget. We declined the offer and booked our own $2 taxi to the Southern Bus Terminal through GrabTaxi. As we exited the taxi at the Southern Bus Terminal (Pinklao), Michael and I were surprised to find that we didn’t see a bus terminal at all, but a series of chainlink fences, barbed wire, and blocks upon blocks of open faced concrete buildings with nothing alive in sight except for chickens. CHICKENS. The taxi driver seemed to have no clue what bus station we were trying to get to, and neither did we. We saw online that the bus only departs once every hour or so from the Southern Bus Terminal to get to the Floating Market. Michael and I had approximately 10 minutes to make it, as we wandered amongst alleyways and barbed wire fences. Finally, we see an opening in the fence, to a rather large, but completely wall and roofless (possibly condemned), building that resembled somewhat of an old station. Scattered around the station, were small van-like busses. No signs, and not much movement. As we wandered to the front of the building, we noticed people were sleeping in some of the busses, and others had set up hammocks within the empty concrete structure. Michael and I tried asking if this was the station, then continued to punch things into google translate, and could not figure an answer. Finally, someone near the other side of the building pointed in the completely different direction from where we came. We decided this must mean that the station would be that direction (hopefully). Now, in a rush, we speed-walked another 5 minutes over a series of empty parking areas and roads amongst the fences. Then we found a much smaller inconspicuous building, but complete with windows and a door. Promising. We entered inside to find counter-spaces with receptionist windows, but no people at all. It was completely empty. Now, about ready to give up, we walked to the back of the building and peaked by the exit, only to find a huge crowd of people around tables and printed signs. As we smile because we just now finally found people, we exit the building only to be greeted with everyone shouting and waving signs towards us. Every single person on the concrete porch yelled at us “DEAL! DEAL! ONLY 50 BAHT!! FLOATING MARKET FLOATING MARKET GO NOW”!! More confused than ever before, we try to make sense of the signs they are waving. One of the ladies tugged my shirt and said, “50 baht, we go now” so I turned to Michael and we were on our way. She runs us past a series of vans to an open one, ushers us in, hands us little papers with scribbles on them, and shuts the door. Luckily, we’re not the only ones in the van. We take our seats near the back, and as we roll out of the bus station immediately open Google Maps to track where we’re heading - because honestly at this point we had no idea if we got on the right bus. We ask two people sitting in front of us if they are going to the market, and they politely responded “No English, Chinese.” But they did manage to communicate that they were going to the train station. The hour and a half ride was peaceful, but slightly unnerving as we only really knew this bus was going to a train station outside the city. None-the-less, we were going the right direction, and we made it close to Damnoen Saduak. When we exited the bus, we were once again in the middle of nowhere. But this time, instead of being surrounded by concrete, we were surrounded by palms and jungle, and it was pouring. With one structure straight ahead, and the bus driver pointing that direction, I quickly handed him our 100 baht and the two scribbled papers and ran across to the singular building. We were at a loss. We thought we were doing a great job navigating, saving a ton of money, and seeing the market like a local. Now, we are being swindled into paying a large amount to rent our own boat. We would have been happy to share a boat with others if this had been an option. We weren’t about to let this rain on our day - just the huge amounts of water dumping from the sky could do that at this point. We paid the fee and were immediately shuffled onto the nearest longboat. The driver introduced himself by abruptly slamming the engine and ripping ahead in the water. Water splashed over the sides and the rain came around the small roof above us, and Michael and I smiled nervously at each other as we hugged our backpacks from the rain. Finally, Damnoen Saduak Floating Market! Making our way to the market, we were struck by the beauty of the canals. Winding in and out from each other, houses were scattered throughout with beautiful banana trees, flowers everywhere, and merchant’s thatched docks along the sides. We took a turn from the main wide canal, through an elaborately decorated entrance gate to a much smaller, but much busier canal. The Floating Market! We finally made it, and we knew so by the rush of delicious smells and vibrant colors everywhere. Even through the downpour, the canal was filled with people. Longboats floated by with mango sticky rice, and merchants beckoned us to purchase their ‘one-of-a-kind, always hand-made Thai souvenirs’. Our boat driver knew just which shops he wanted to stop at, and always took a small commission from whatever purchases we made. We didn’t have much of a choice of where we did and didn’t stop, but we enjoyed the experience none-the-less. We had incredible Pad Thai served to us boat-side, and we gorged on some Chicken-Sattay. We were soaking wet, but it was paradise. It was also plenty obvious that there were tons of places along the Floating Market to rent or take a quick ride on a long boat. And disappointingly, the entire area was very walkable. Many tourists and locals alike were greatly enjoying the market from the walkways adjacent to the merchant stalls. I mentioned to Michael that I honestly would have loved to have been able to take some extra time to go where we wanted, and walk freely in the market. Our boat arrived back at where we boarded, and we exited to inside the building where we treated ourself to Thai iced tea before our van arrived to take a group of us back into Bangkok. A surprising, unexpected, yet successfully fun excursion. We should have done our research when it came to getting outside the big city, and how best to see Damnoen Saduak. However, I don’t regret our experience. Sometimes, flying by the seat of your pants brings the most vivid and cherished travel memories. Overall, we saw it on our own, rented our own private longboat, and had a roof through the rainstorm while most on the canal only had their own umbrellas. At least, now that you’ve read this blog, you know a bit more and will be way more prepared than Michael and I on your journey to Damnoen Saduak Floating Market.